It was quite a homecoming for Downs (Kansas) High School Alumnus Kevin Saunders last Friday – one that he nor the people of Downs will soon forget. Kevin just 10 years ago Kevin was running on the dirt track that was here when he was in High School in the mid-1970s. A graduate of DHS, Saunders who spent his college years playing football, competing in track, soccer & rugby and going on to graduate from Kansas State University with a degree in Agriculture Economics was never prepared for what was about to happen. After graduating from Kansas State University Kevin moved to Corpus Christi, Texas, where he began his career as a Federal Inspector for the USDA, inspecting some of the largest grain elevators in the world. But on April 7, 1981, a grain elevator explosion changed Kevin Saunders life forever. Kevin Saunders was working in the Government building near the elevator at the time of the blast. Men and debris & huge pieces of concrete weighing over a ton were hurled hundreds of feet through the air, 10 died from the deadly blasts that ripped through the grain elevator at 1,500 feet per second. Due in no small part to excellent physical conditioning he survived and Kevin Saunders give thanks God for giving him a second chance. Saunders survived the blast, although he was hurled over 300 feet over a 2 story building onto a concrete parking lot nearly in the channel where huge cargo ships waited for their cargoes of grain. Doctors did not think he would live as he slipped in and out of a coma with massive internal & external injuries. His skull was crushed, back broken, lungs collapsed and had no use of one arm and either of his legs. After almost a year of hospitalization, more than half of which was spent in a rehabilitation center T.I.R.R. in Houston, Texas where he regained the use of his arm and learned how to begin life again with a new body that was paralyzed from the chest down. To compound his struggle, he was forced to spend many months in a body cast and his wife left him. 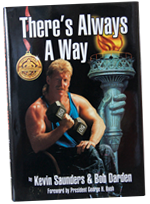 And he speaks with authority, having become one of the best wheelchair athletes in the world. 1989 – Just 4 years after the donation of Saunders’ Track, the Downs High School Track team went on to win their school’s first State Track & Field Championship! Kevin Saunders generosity, while beautifully illustrated by his substantial donation for the new track at Downs High School, is certainly not limited to that project. Prior gifts include computers, shop equipment, audio-visual equipment and typewriters. At Friday’s ceremony, he could hardly catch his breath between greeting old friends and athletes from other schools he competed against. He seemed reluctant to talk about his role in the track project, instead asking others if they thought it turned out well, or how have the kids liked it? 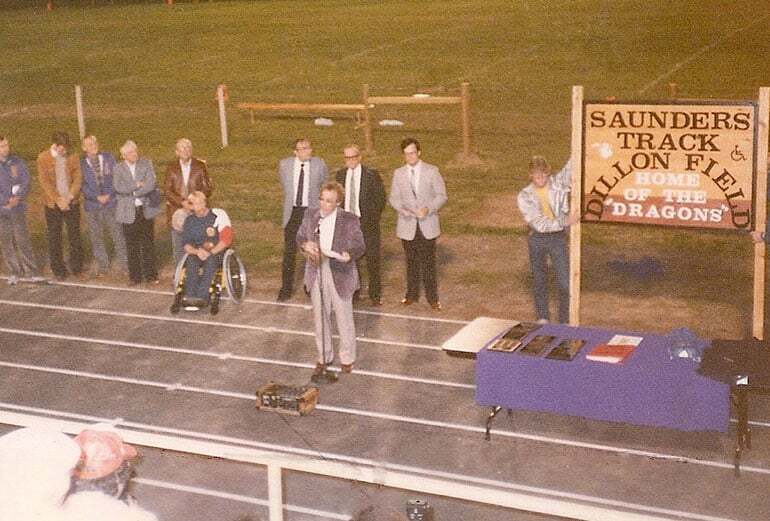 Don Koops said that Saunders wanted to build the track so those who have the use of their legs or not would all have a facility to use whatever God has given them to the fullest potential. Saunders said personal creed: Never Give Up! is best reflected in the message from the Olympic Games “The important thing in the Olympic Games is not to win, but take part. The important thing in life is not the triumph but the struggle” Saunders added I hope this track will make the difference in giving these young athletes an opportunity to fight and struggle to become successful on fields of competition in sports and in life.